This past weekend I was the “caterer” for my mother-in-law’s birthday party, which I absolutely love to do (seriously, I love cooking for groups of people!). I wanted to prepare dishes that were both apropos for the season and moderately healthy… However, I had the added challenge of making sure that at least some of the preparations were vegetarian as one of the guests practices that dietary lifestyle. Back in the day this would have been a little more challenging for me as I was the king of adding bacon, or sausage, or eggs, you name it, to dishes to gain more depth of flavor, but I’m finding that it is becoming easier and easier for me to cook with vegan or vegetarian restrictions and still make delicious food. Don’t get me wrong, I’m still a card carrying carnivore, but I least I no longer shudder when I hear the word vegan… lol! So here we have one of the side dishes I made for the party, Roasted Winter Vegetables with a Maple Butter Glaze. If you are a practicing vegan, then feel free to take out the butter. It simply cuts the syrup a little while adding richness to the dish. Serves 8-12 as a side. Heat your oven to 400F. In all likelihood you do not have a sauté pan large enough to accommodate all of the vegetables at one time, I know I didn’t. To solve this, I separated the vegetables into three batches and cooked them separately, each time using 1tbsp of olive oil and 1tsp each of salt and pepper. Heat the olive oil in the sauté pan on high, add the vegetables and seasoning and cook until lightly browned, stirring periodically. Once sautéed, place them in a 9×13″ baking dish. Combine the maple syrup and melted butter, then pour the mixture evenly over the vegetables. Bake uncovered for 30 minutes at 400F. There you have it, a hearty, delicious, and easy to make side that’s perfect for the fall and winter! Enjoy. 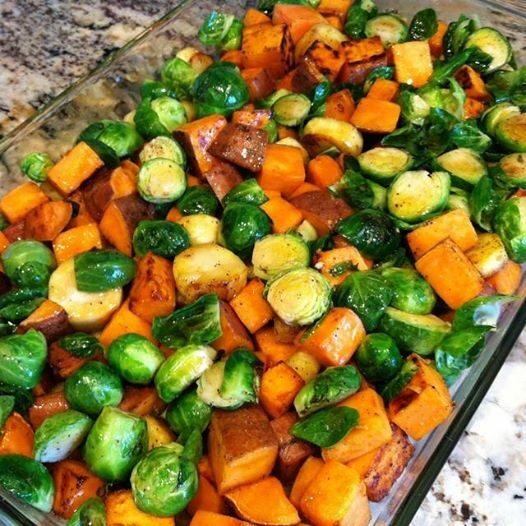 *Note: The picture was taken before the vegetables were roasted in the oven. In the moment of trying to feed 15 people I forgot to take an “after” shot… The only difference in appearance is that the vegetables will be more deeply browned after they’re baked. Tags: butter, cooking, food, gluten free, maple, parsnip, perfect pairings, perfect pairings at home, sides, sprouts, sweet potatoes, vegetarian, winter vegetables. Bookmark the permalink. Reblogged this on Cooking Up a Storm With Miss Polly. How to make a kickass burger!